Two hours and fifteen minutes of non-stop, face hurting, grinning. Episode Seven takes everything that is great about Star Wars and perfects it. If the same film had been made sans the Star Wars title and the character’s name it would still be a great film, just not the huge success that is The Force Awakens. That is to say, Episode Seven is a great film. You’ll come out of it very content. Every plot point is intentional and well executed. There is no unnecessary fluff, and yet is manages to land just the right amount of flourish. Daisy Ridley’s Rey and John Boyega’s Finn are clearly having the time of their lives making the film. As are all the cast and crew. It definitely shows. Simply put it’s five stars. 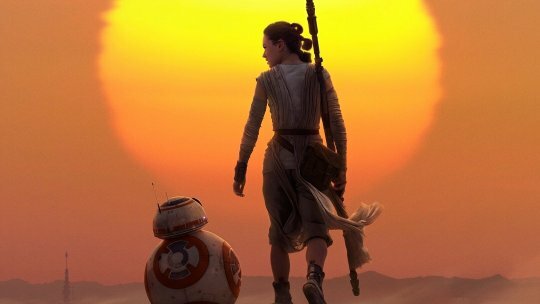 Not only does J.J. Abrams deliver a solidly outstanding film with The Force Awakens, he delivers an undoubting hope for the future of the franchise. I can’t wait for next year’s instalment, Rogue One (part one of the spin-off anthology). Also the visual and special effects are outstanding. Along with the amazing cinematic story telling. I think we’re back in the era of the beautiful, well thought out, locked off shot. Gone is the 2008 shaky-cam. Plus, the score and the audio mix made the whole experience almost too real. That thunder under the seats is why cinemas are still essential.